Hi hi! I am Antoinette/Finch and I make pixels. I also like birds so there's what this is about- little birds in a big bird world. 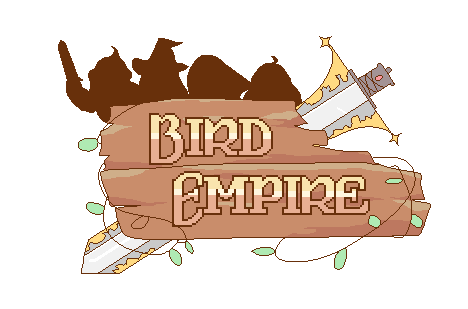 Bird Empire is a pixel RPG style game. The Bird Empire has fallen on dire times after the succession of King Midas. The greedy, kleptomaniac king has hoarded all money and left the empire to fall into ruin. The birds begin to get restless. A revolution begins and Hero, a young cockatiel just kicked out of home, is scouted. Hero must scout out help and together, journey to the capital to confront King Midas, all while facing the dangers the journey brings. The birds will kiss your cheeks, many times. Many bird kisses on the cheek, many, many times. Any pledge $35 and over will get you your own NPC sprite sheet with a total of 8 sprites. It will appear as a background bird in the game. The sprite can be of any bird species of your choosing. As much as I want to, I can't do everything on my own. The total pledges go towards our very talented team of musician(1), writers(1), animators(1) and also my rent. The total goal may be subject to change once more people are on the team. Thank you for your support! At the moment we're in need of a pixel artist and/or pixel character animator, please contact me here or at any of the links in the overview/about if you would be interested in joining the team.